Drywall finishing inside Alumni Hall. Worker uses a welder to attach mounting plates to a pipe, during installation of utilities in Alumni Hall. Large fans keep air moving as drywall installation continues inside Alumni Hall. An electrical worker checks conduit after bending, as utilities are installed throughout Alumni Hall. Even though stairs have been installed between floors, scaffolding remains in place in the center section of Alumni Hall, allowing workers access to upper levels and the underside of the roof. 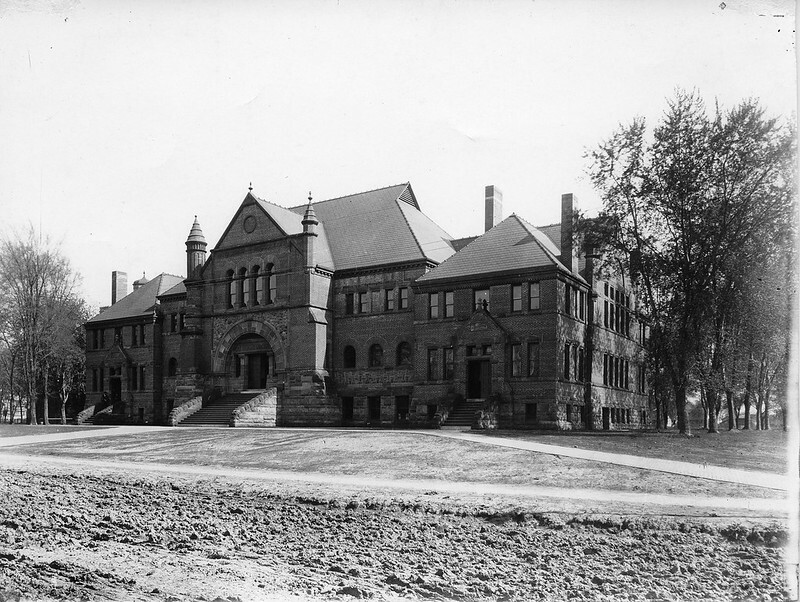 This is a shot of the south side of Alumni Hall some time after 1960. The back side of Alumni Hall has a lot of green leafy landscaping, too, which is different from other shots of the building we’ve seen. 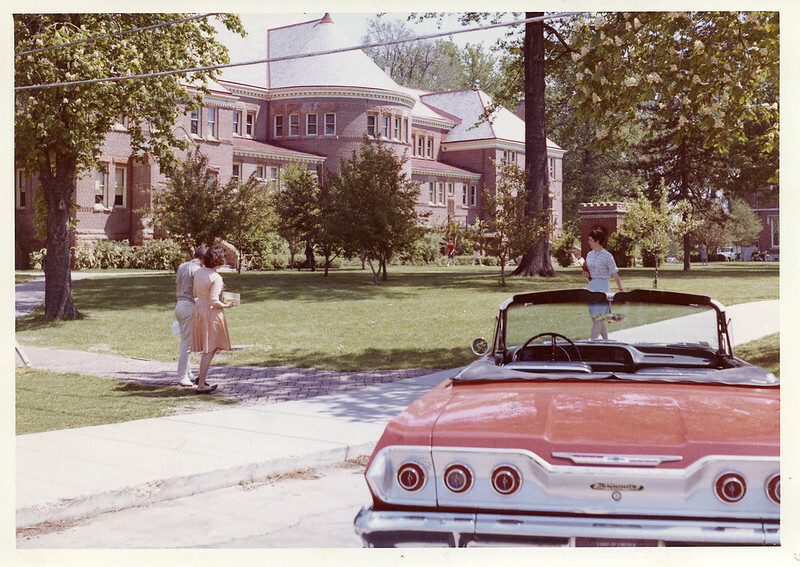 Car buffs get bonus points and bragging rights if they can identify the make and model of the car in the foreground! The square cement pads that served as anchors for the steel supports on the east and west outside walls are being excavated and broken up, following removal of the steel itself earlier in the year. Old Main, seen through a window in Alumni Hall during the renovation this summer. 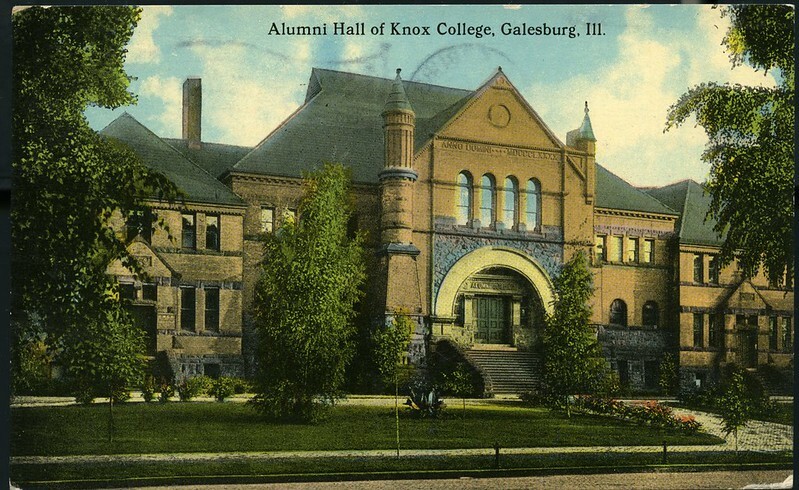 If you were writing to friends back in 1893, you could’ve done so on the back of this postcard featuring a picture of Alumni Hall. How often do academic buildings get their own postcards today? This helps us understand just how interesting and exciting the Alumni Hall building was back when it was first constructed.